And did you know you can cultivate a space garden of your own here on Earth? August 11, 2015, 10:18 a.m.
How about a little vitamin K with your zero G? This week, for the first time, astronauts ate lettuce grown aboard the International Space Station. The leafy snack is the fruit of the Veg-01 program, an experiment conducted by NASA to explore the growth, harvesting and consumption of crops in space. The lettuce was grown in the Vegetable Production System and is referred to aptly as "Veggie." The Veggie systems were created by the Orbital Technologies Corporation (ORBITEC) in Madison, Wisconsin and subsequently tested at Kennedy Space Center. The lettuce was grown from seeds situated in "pillows" and then inserted into Veggie's "root mats." The mats are then installed in the Veggie machine. Water and light are added, and about a month later, lettuce is ready for harvest. Prior to this yield, the first crop of the lettuce was brought back to Earth in 2014 and tested to be certain it was safe for human consumption. The astronauts ate red romaine lettuce dubbed "Outredgeous," due to its dark crimson hue. Its specific color is the result of the type of LED lights used by Veggie. Red and blue lights are used because they provide the most efficient fuel for plant growth. Green lights were included so the lettuce wouldn't look purple and unappetizing on the plate. Making the plants appear "normal" for the sake of those eating them represents another facet of the Veggie project: human psychology. Food science has always been an important topic in regard to the ISS and the future of space travel. Living in space causes specific stresses that must be offset for astronauts to function in good health. Not only is growing sustainable food important for feeding hungry astronauts on long missions, but studies show that the presence of plants is beneficial to mental health in general. 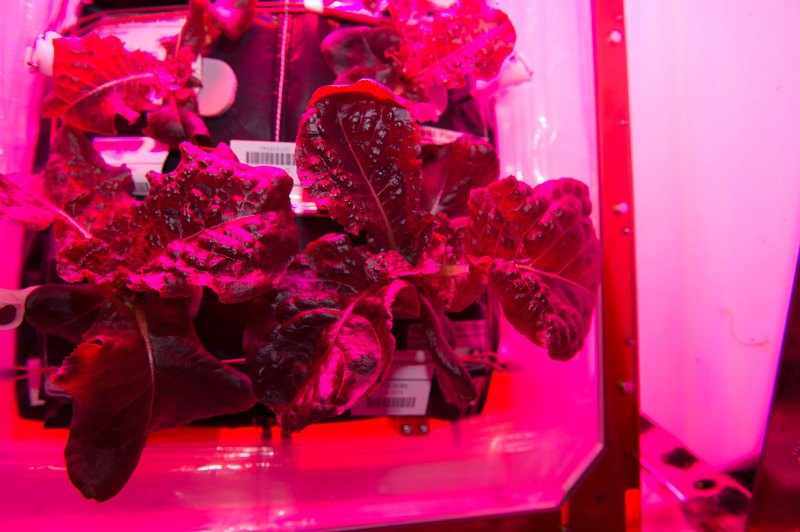 When in close confines on the ISS (or in the rockets of future missions), gardening provides astronauts with a meaningful hobby, delicious benefits notwithstanding. When asked about the astronauts' experiences with gardening, ORBITEC's Paul Zamprelli explains that the astronauts "loved" it. He states, "Veggie is something that is very wholesome and good and fun. It was a lot of fun for them to tend to the garden, to tend to the plants. It turned out very well." Zamprelli further explains that Veggie also may provide those of us with our feet on terra firma with a variety of benefits. ORBITEC is working with countries like Dubai that import most of their fresh vegetables. The Veggie system can be buried underground in warehouses and fueled by solar energy — and there are other sustainability-minded options. It also shows us that what we learn in space can inform our lives on Earth. If you want to space-garden at home or introduce kids to a tasty side of STEM, ORBITEC also makes an affordable kit. Veggie is also growing zinnia flowers to understand how pollination works in space, an experiment that has implications from fruit growth to terraforming or the concept of transforming a planet to function like Earth. There are future plans to grow other types of fruits and vegetables, too. Perhaps the ISS astronauts will soon be able to grow a whole salad bar — a far cry from the days of Tang. Could lights be the future of pesticides? The Veg-01 program is a NASA experiment to explore the growth, harvesting and consumption of crops in space.